At Professional Firearms Instruction, LLC we pride ourselves in providing the best experience possible for our Customers. Our course offerings range from Basic Handgun and Utah Concealed Firearm Permits, to Defensive Handgun and Active Shooter Response. Our instructors travel around Northern Utah providing instruction to families, friends, educators, companies, and other organizations throughout the region. Our public courses are offered on a regular basis through the local colleges and shooting ranges. Private courses are designed and scheduled to meet the needs of our customers. Our online store, Firearmsprostore.com allows us to offer our favorite products at some of the best prices. Our extensive product lineup includes: Fenix Lights, 4Sevens, Condor Tactical Gear, TASER Products, Crimson Trace, Trijicon, Eotech, PFI Custom Gear, OTIS, SGMT, Kershaw, Leatherman, FNH, Arsenal, Glock, Leapers, Springfield Armory, Kimber and much more. 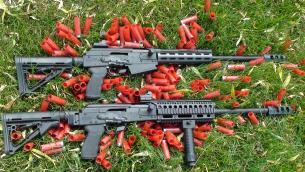 Our Gun Shop specializes in Saiga/AK Rifles and Shotguns. We stock parts, accessories, and magazines. We also offer complete pistol grip conversions and some of the sweetest Custom Saiga Shotguns available. We are continuously growing and adding products. If you don’t see what you are looking for, please let us know and we will get back to you as soon as possible with pricing and availability.